The Ministry of Health decided on May 4 to suspend the use of Quinvaxem, the made-in-Korea vaccine against five childhood deadly diseases, after nine deaths and dozens of cases of severe allergic reactions among local infants were reported over the past six months. Since last November, nine newborns from different provinces died after being vaccinated with Quinvaxem, which is meant to prevent five common, potentially fatal childhood diseases: diphtheria (D), tetanus (T), pertussis (P, whooping cough), hepatitis B (HepB), and Haemophilus influenza type b (Hib). All of the babies who died were in good health, but hours after receiving the vaccine they began wailing loudly, convulsed, and had serious trouble breathing, before passing away shortly after. Despite several tests, no scientific evidence directly connecting the vaccine with the deaths or severe allergies has been provided, while health officials stressed that the vaccine batches involved were good quality and met all technical requirements. However, no evidence has been produced to exclude the vaccine as a reason either. According to Trinh Quang Huan, former deputy health minister, out of the 42 batches of Quinvaxem vaccine imported by Vietnam, over 20 resulted in minor to severe allergic post-injection reactions. Huan also noted that whole-cell pertussis vaccines, like Quinvaxem, are among those that cause the most allergic reactions. After severe reactions were reported in different provinces after immunization with Quinvaxem, provincial health departments halted the use of the vaccine. Nguyen Nhat Cam, head of the Hanoi Preventive Health Center under the Ministry of Health, said that though tests on the vaccine batches suspected to have something to do with the deaths last January proved that the vaccine involved was fine and stored correctly, his center still halted the use of the vaccine, with some 3,000 remaining doses. 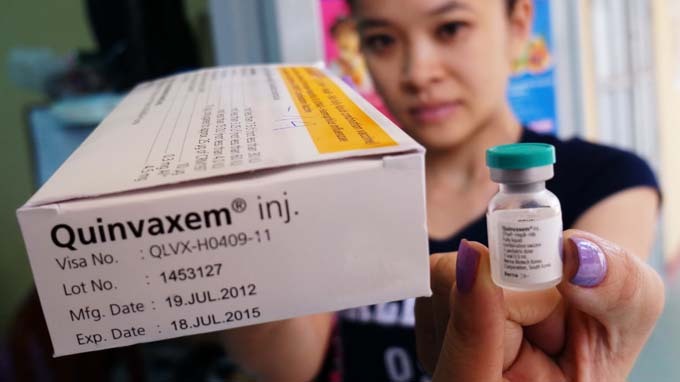 According to the ministry, Vietnam uses up to 4.5 million doses of Quinvaxem vaccine a year to immunize 1.5 million children younger than one year against the five said diseases. The ministry has yet to provide guidance on which vaccines can serve as a substitute for Quinvaxem. Meanwhile, the Drug Administration Office suggested that the substitutes could be Hepatitis B, and Haemophilus influenza type b vaccines as separate ones and a three-in-one vaccine to immunize against diphtheria, pertussis and tetanus. The office said it is ready to import substitute vaccines on the ministry’s request. Cam also urged the ministry to provide guidance on the replacment vaccines soon, as Quinvaxem is used for babies while the three-in-one vaccine is for 1.5-year-old infants. He also stressed that, regarding the fatal risk of the five diseases, the lack of vaccines in the long term may cause vaccination loopholes. Meanwhile, Huan urged the government to provide funds or seek sponsorship to acquire five-in-one or six-in-one substitutes. According to Tran Phu Manh Sieu, head of the Ho Chi Minh City Preventive Health Center, in case that the suspense of Quinvaxem and lack of official substitutes lasts more than 15 days, parents can take their newborns for serviced vaccinations at local hospitals and health centers, where other vaccines to immunize against these five disease are readily available. According to the World Health Organization several countries including Sri Lanka and Pakistan have ordered the withdrawal of Quinvaxem, produced by South Korea’s Berna Biotech Group since 2006, from their markets following multiple deaths and severe allergic reactions among local infants. Local governments have investigated the issue with the assistance of WHO, but they failed to prove the connection between the use of the vaccine with the deaths or severe reactions. Around 429 million doses of Quinvaxem vaccine have been used in over 30 nations since 2006. Every year, Vietnam consumes 4.5 million doses of Quinvaxem since 2010.